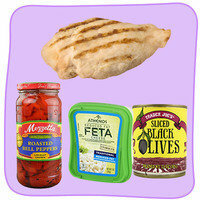 I always keep chicken breast in my fridge and freezer -- it's my go-to protein for lunch and dinner. But I'm getting so bored with plain chicken! How can I make it more exciting without spending a lot of time in the kitchen? Fruit and chicken go so well together, and this combo doesn't even require any produce chopping. Pick up some salsa studded with peaches, pineapple, or mango. Newman's Own makes some great ones. Or DIY by whipping up a batch of this Tropical Pico de Gallo in advance! 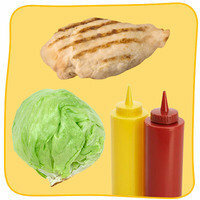 Create a variation on a burger by wrapping the chicken in lettuce. Iceberg is great if you like a little crunch, but butter lettuce works too. Add classic condiments -- ketchup, mustard, and pickles -- for a burger fix with a fraction of the calories and fat. 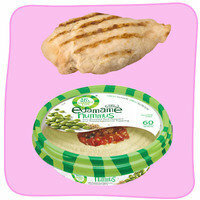 Speaking of Mediterranean flavor, hummus is a great way to zazzle up that chicken. And it's protein on protein, so you know you'll be satisfied after eating it! My favorite hummus these days is made by Lantana. I love that some of the flavors come in single-serve containers. What's better than a bowl of steamy tomato soup? 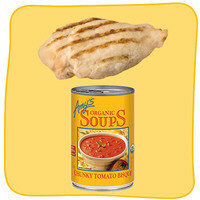 Steamy tomato soup poured over chicken like a sauce! My favorite, hands down, is Amy's Organic Chunky Tomato Bisque. There's even a Light in Sodium version of that soup, which rocks. Frank's RedHot Original Cayenne Pepper Sauce makes just about anything taste like Buffalo wings. (I'm pretty sure my tennis shoes would taste like wings if I doused 'em in Frank's!) 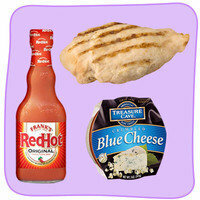 Coat your chicken with the hot sauce, and sprinkle with blue cheese crumbles to seal the deal. 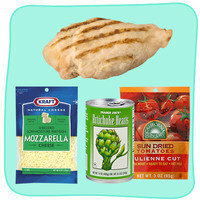 Enjoy the taste of chicken Parmesan without all the extra calories and fat. 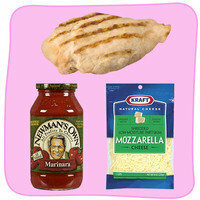 Just slather low-fat marinara sauce on your chicken breast, and top with shredded part-skim mozzarella cheese. Heat until the cheese is nice and melty, and dig in. 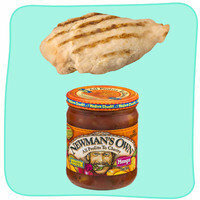 You know you're not the only one who's bored with chicken -- click "Send to a Friend" now!